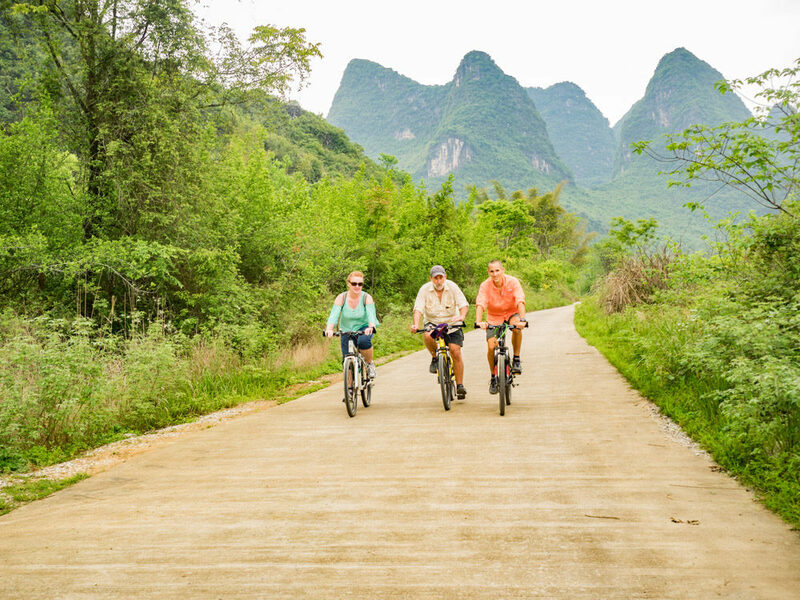 The best way to explore the countryside around Yangshuo is on a bike. Hands down. Well, it’s actually the best way to explore any new area outside of the city, but Yangshuo just happens to be a particularly awesome spot for adventuring on two wheels. 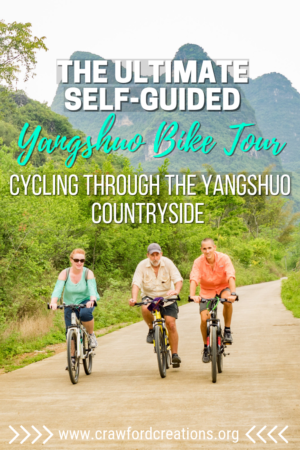 Why Should You Go Bike Riding In Yangshuo? You know that person that just seem to be friends with everyone? The one that is friends with so many different people, all of whom have not one bad word to say about them? Yangshuo is that friend to cyclists. 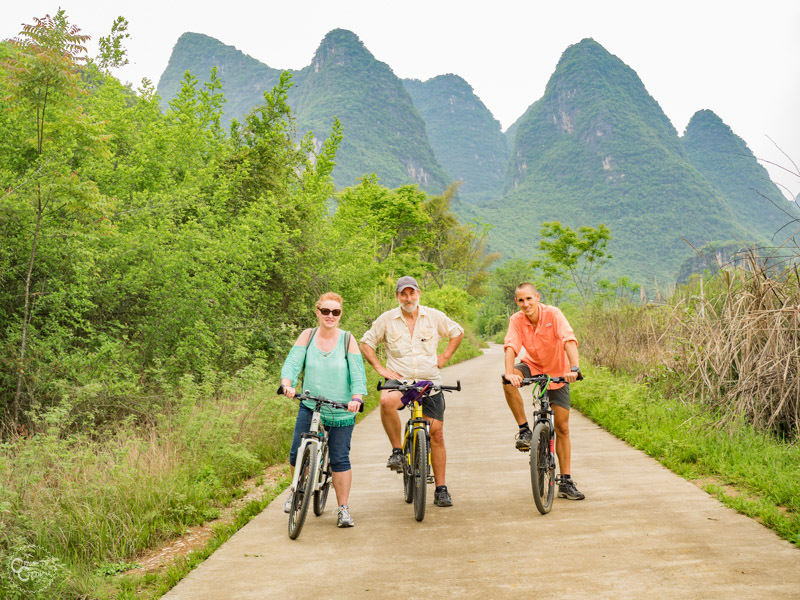 Like seriously, Yangshuo caters to every type of cyclist, and non-cyclist, on the planet. If you haven’t ridden a bike since you were 10 (no joke, this was me a few years ago), there are short, flat, incredibly scenic routes with zero traffic that would be perfect for you. If you’re a serious road biker, there are long routes with hill climbs and beautiful scenery that you’ll love. And if you’re into mountain biking, there are tons of trails through the rice fields and mountains for you to kick up some serious dirt. I don’t know anyone who’s been to Yangshuo, cyclist, or couch potato alike that has ridden a bike through the countryside and not loved it. I mean when you get to see the most beautiful karst mountain scenery in the world and have your choice of back roads without any traffic how can you not enjoy cycling in Yangshuo? The best place we found to rent a bike in Yangshuo was in the parking lot at the entrance to Yangshuo Park, located just past West Street. The people there offer the best deal on rental bikes you’ll find anywhere in the city, and, while they don’t have road bikes, their selection of mountain bikes and city bikes is on point. Honestly, if you’re a road cyclist, you’ll be hard pressed to find a road bike to rent anywhere in Yangshuo, even with it being such a cyclist haven. China is the land of mountain bikes, maybe because the roads used to be really poor, (they’re fine now) I’m not really sure. But whatever the reason, they love their mountain bikes over here. They even have mountain bike races on the paved roads at all the cycling events in China. It’s nuts! If for some reason you can’t find the rental place at Yangshuo Park or they’re all out of the type of bike you want, there are plenty of other rental places located along West Street or the main road. Also, many hostels and hotels in Yangshuo have their own bikes for rent, so it’s possible you could rent a bike through your accommodation. 25-50 Yuan/day for a mountain bike. 10-30 Yuan/day for a city bike. The place outside of Yangshuo Park rents mountain bikes for 25 Yuan. The first day in Yangshuo we rented bikes from a shop on West Street that charged 50 Yuan to rent a mountain bike. We thought that was fine, until the next day we stumbled upon the bike rental place outside of Yangshuo Park charging only 25 Yuan for the exact same quality bikes and then I knew we had gotten ripped off. Moral of the story, don’t rent your bike on the most popular tourist street in town. Lesson learned. Also, just a caveat, neither of the 3 places I’ve rented bikes from in Yangshuo provided helmets. Helmets are not commonly used in China, and honestly, to just go for a leisurely ride down a back road without any traffic you’ll be fine without one. But if you’re concerned about it or you’re looking to go for a long, hard ride on bigger roads, ask at one of the bike shops in town if you can borrow a helmet. Water is a must no matter how short your ride is, especially in the summer. Yangshuo has a subtropical climate and is hot and humid for the most of the year so, when in doubt, always have water with you on the bike. All the bikes we rented came with storage for 1 water bottle on the bike frame. Whether or not you need to bring snacks depends on how long your ride is, so, ultimately, it’s up to you, but I will leave you with this golden nugget of common sense, for a long ride, bring snacks, for a short ride, it’s probably not necessary. Also, if it’s sunny you should definitely wear some shades as most of the roads around Yangshuo are concrete and the light color really reflects the sun into your eyes. Trust me, the last thing you want to do is be squinting the whole ride from the sun in your eyes and then end up with a headache. I speak from experience. Depending on your speed, of course, it will take around 2 hours of ride time to complete this route. But, if you want to stop and take photos or explore a cool site we would recommend factoring in half a day for this excursion. Riding along the Li River is a great way to spend a morning or afternoon in Yangshuo. This ride leaves Yangshuo going south along the Li River and then loops around through the mountains on the way back to town. Again, this route is approximately 2 hours of ride time, but will probably end up being a half day excursion by the time you factor in stop time to take photos and explore the surrounding area. This route heads out of town on the main scenic road past all the major tourist attractions. You’ll ride around Moon Hill, winding your way around the mountains before crossing the Yulong River and turning back towards town, riding next to the river back into Yangshuo. While this ride should take you around 3.5 hours to complete on the bike, I would definitely dedicate a full day to ride this route. This ride takes you from Yangshuo to the old town of Xingping and back. Xingping definitely warrants a couple hours of your time to explore. It’s small, but it’s a really cute ancient town with some great lunch spots. If you have the energy you can also climb up Laozhai Mountain right on the edge of town next to the river. It’s a 30-minute walk up steps and the view from the top is absolutely incredible. It’s one of the best mountaintop views we’ve ever seen! Oh, and when in Xingping be sure not to miss the 20 Yuan Note Scenic Spot, which is, exactly as it sounds, the spot where the photo on the back of the 20 Yuan bill was taken. To find it, walk up the main road following the Li River upstream maybe 500 meters and you’ll see the spot next to the river on the left (there’s a sign for it once you get there). To get to Xingping, take the X094 out of Yangshuo and ride it all the way to Xingping. 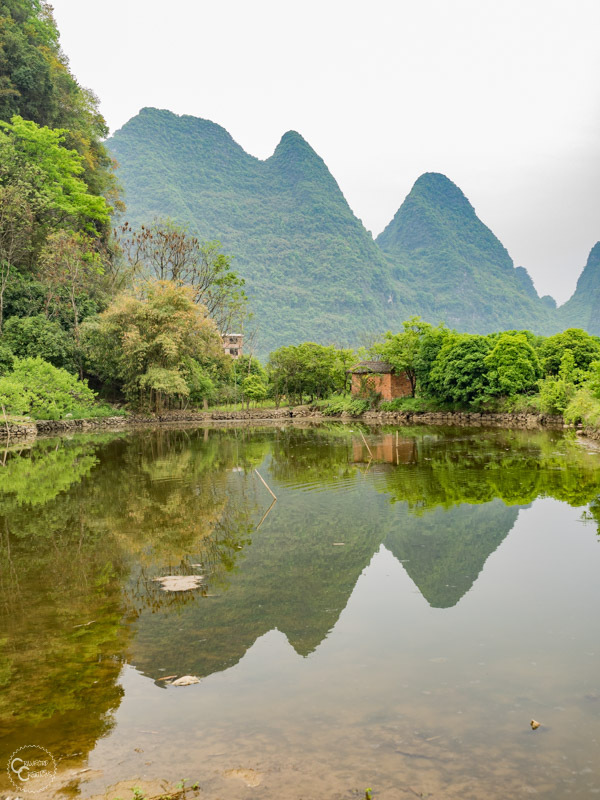 To return to Yangshuo, follow the path that runs alongside the Li River all the way back into town. This route makes one big loop with Xingping and Yangshuo on either end.